Have prepared one pre-baked pie shell of your choice. We use an all butter crust. Recipe below. This recipe makes one double crusted, 9-inch pie. To pre-bake a crust for a custard pie: Roll one disc of crust out to fit a 9-inch pan, about 1/4 inch thick. Place in a buttered pie pan, and crimp the edges as desired. Allow to rest and cool in freezer or fridge for at least 20 minutes. Fold in eggs and then blend? What’s the point of folding it in then. Thank you for posting this recipe. It is amazing, I think it is like having Creme Brulee in a pie, amazing! Simple, uncomplicated flavors are often the most comforting. Delish! I was about to make this, but I am confused by the instructions for the egg and cream. Would you please clarify: Do I beat the eggs before I fold them into the mix? I always believed folding eggs was done so as to not destroy the air that had been whipped into them. I’m confused then why I would mix in cream after the eggs. Any clarification would be appreciated! I’m eager to try the recipe. Thank you! This was really, really good. Sugar and salt. My two favorite favors. WOW. this pie sounds amazing! 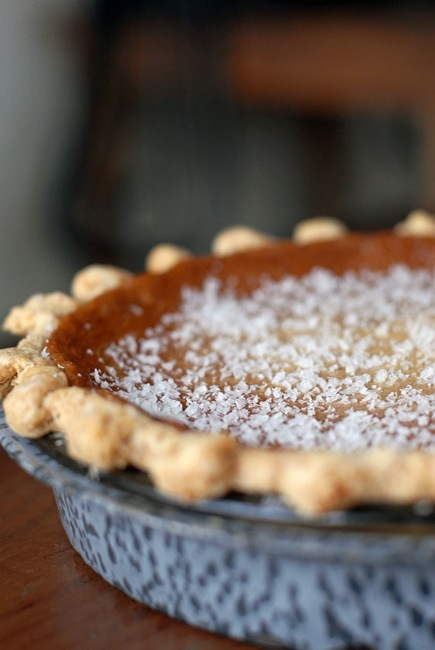 I made a Brown Sugar Buttermilk Pie to die for last Thanksgiving – I think this one is on my list for this year. Thanks for sharing the recipe! this looks so good. I have never had a honey pie! I’m so excited by this recipe. We had something similar at our local pie restaurant, and I really want to try my hand at it. I couldn’t believe how well the salt and honey worked together. This pie is in my top 3 favorites. Yeah! This pie is to die for…so smooth, not too sweet and just fantastic! Can’t wait to try it at home. Thanks for sharing the recipe. I traveled to Brooklyn recently because my daughter had my first grandchild. We visited your establishment and tried several of your pies purchasing some slices and a whole pie as well. My favorite was this one until I tried the black bottom oatmeal later. Seeing the website made my mouth water especially when I saw the bittersweet chocolate pecan listed under Valentine’s Day Greatest Hits. I would like to see the recipe for Black Bottom Oatmeal.